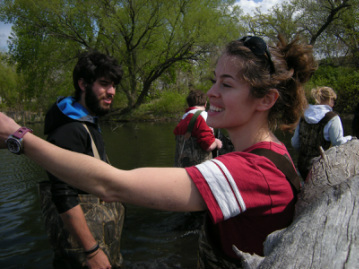 I study biotic interactions in streams, focusing on host-parasite and predator-prey relationships. For my dissertation I am investigating both causes and consequences of nematode parasitism in mayflies. Specifically, I am asking how animal behavior interacts with environmental change to influence where parasite epidemics occur and how parasites affect the food web interactions of their hosts, such as vulnerability to predation. In addition to parasite ecology I am interested in how people perceive the creepy, crawly or “gross” elements of biodiversity and I try to find creative ways to communicate about nature's unseemly side.